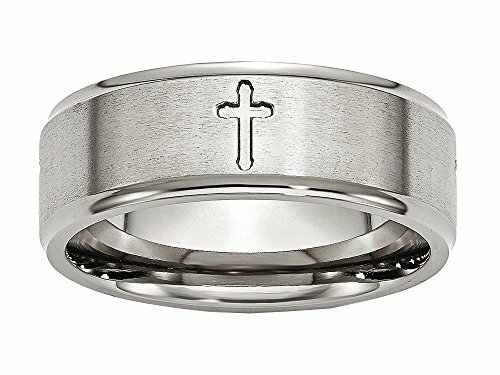 ICECARATS DESIGNER JEWELRY TITANIUM RIDGED EDGE CROSS RELIGIOUS 8MM BRUSHED WEDDING RING BAND SIZE 12.00Material Purity : TitaniumFinish : Polished & BrushedBand Width : 8 mmFeature : Nickel FreeMaterial : TitaniumRing Fit : ComfortSizeable : NoWidth : 8 mmEngravable : YesProduct Type : JewelryJewelry Type : RingsSold By Unit : EachMaterial Color : GreyRing Type : Wedding BandsEdge Type : RidgedOUR MISSION & BELIEFSOur mission at IceCarats is to celebrate our customers and enhance their lives journey, honoring life's memorable occasions and enhancing the beauty of everyday through our extensive collection of quality jewelry.THE ICECARATS STORY - CRAFTSMANSHIP...QUALITY...VALUEJewelry is our passion - IceCarats is devoted to craftsmanship, quality, and value. Each piece hand stamped for authenticityMADE WITH LOVE FROM US TO YOU - QUALITY WITHOUT COMPROMISEWhen you purchase jewelry from the IceCarats collection, you buy with confidence - Lifetime Warranty and 30-Day Returns .ELEGANT GIFT PACKAGING - JUST ANOTHER REASON TO SAY YES!Receive Elegant Gift Packing On Every Order with IceCarats! 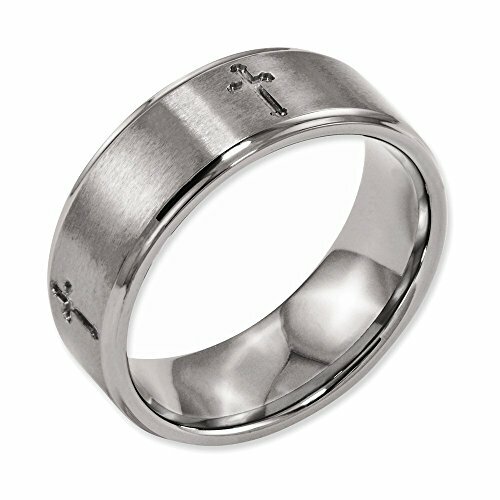 Features:Material: Primary - Purity:TitaniumFinish:Polished & BrushedBand Width:8 mmMaterial: Primary:TitaniumRing Fit:ComfortSizeable:NoWidth of Item:8 mmEngravable:YesMaterial: Primary - Color:GreyRing Type:Wedding BandsEdge Type:RidgedAll weights and measurements are approximate and may vary slightly from the listed information. Titanium Ridged Edge Cross 8mm Brushed & Polished Wedding Ring Band by Chisel Size 15. 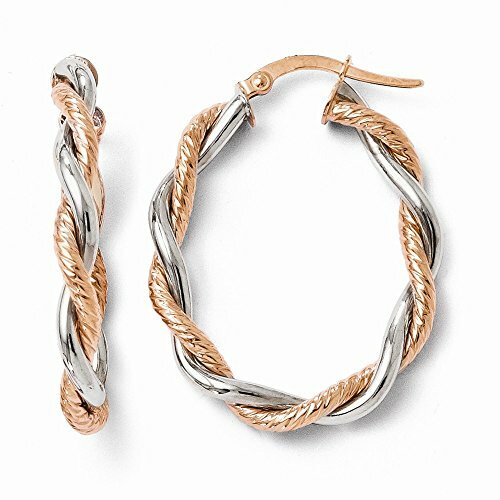 Comes in a beautiful Chisel Gift Box or Pouch. Features: Polished - Engravable - Titanium - Brushed - Ridged edge.All Colored Stones Have Been Treated to Produce and Enhance Color: Amethyst - Heat Treated || Aquamarine - Heat Treated || Citrine - Heat Treated || Emerald - Resin/Oiling || Garnet & Rhodalite Garnet - Not Enhanced || Onyx - Dyed || Opal - Impregnation/Dyed/Heat || Peridot - Not Enhanced || Pearls/Mother-of-Pearl- Bleached/Dyed/Irradiation || Pink Tourmaline - Heat Treated/Irradiated || Quartz - Heat Treated/Irradiated || Ruby - Heat Treated || Sapphire - Heat Treated || Tanzanite - Heat Treated || Topaz - Irradiated/Heat-Treated || Zircon - Heat-treated || Blue, Red & Green Diamond - Irradiated || Black, Brown & Yellow Diamond - Heat Treated/Irradiated. Disclaimer: Diamonds Not verified to have 17 facets. 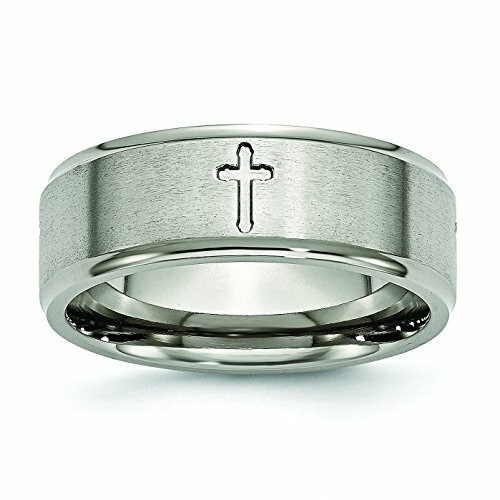 This amazing Chisel Titanium Ridged Edge Cross 8mm Brushed And Polished Weeding Band. 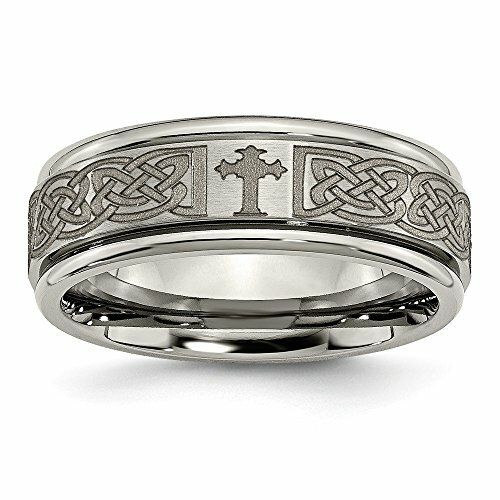 This style measures 8.00 mm wide.Thickness: 2 mm. Metal weight may vary with finger size and metal choice. GIFT CARD OPTION WILL NOT BE AVAILABLE FOR THIS ITEM! Looking for more Titanium Ridged Edge Cross similar ideas? Try to explore these searches: Joe Movie Bravo Vehicle, Ftd White Rose Bouquet, and Gates Power Steering.